I had this happy moment last week where I was flipping channels on the television, idly looking for something to watch, when on came A Knight's Tale. It was near the beginning, right after they'd met Chaucer for the first time, and so I hunkered down and watched all the rest of the film. I didn't have to. It's not like I don't own it on DVD or also know that it's available to stream on Netflix. But I wanted to. It's one of those movies that makes me happy every time I see it, and this was no different. But as I was watching, I got to thinking about the characters, like I generally do, and I realized that I have been utterly remiss in mentioning my favorite thing about this movie on the blog so far. While I have covered the glory of Jocelyn and her status as a royal woman of color in the middle ages, as well as how interesting her insistence that William's love of jousting is no more noble than her love of dresses is, I haven't really ever talked about Kate. And I love Kate. Kate's my favorite part. So for those of you who somehow managed to miss this utter gem, the story goes like this. Will (Heath Ledger) is a poor nobody working for a knight when the knight kicks it before they can all get paid. 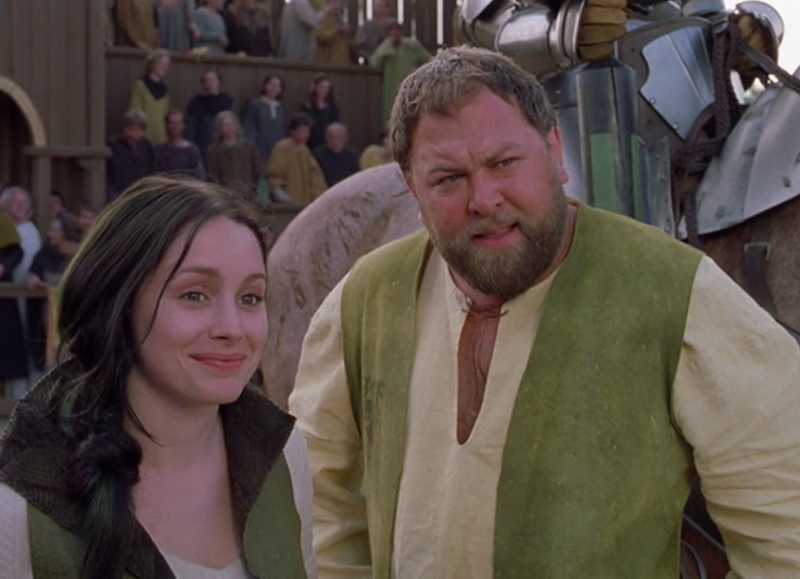 Instead of just hightailing it off on their own, Will convinces the other squires, Wat (Alan Tudyk) and Roland (Mark Addy) to dress him up in the knight's armor and let him finish the tournament. They get their money and figure that this is a good scam and they might as well keep it going for a while. 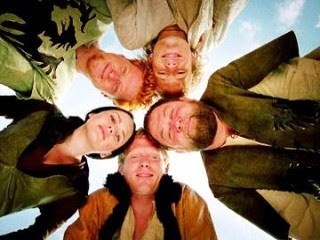 Along the tournament road they pick up Chaucer (Paul Bettany) to act as their herald, and run into a beautiful princess, Jocelyn (Shannyn Sossamon), with whom Will falls utterly in love. 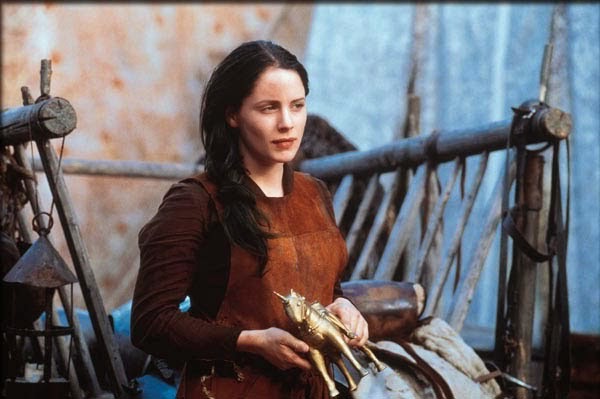 Oh, and they meet Kate (Laura Fraser), a female blacksmith with a chip on her shoulder and the ability to make armor better and lighter than anyone else in the world. What I love about Kate is how much she, as a character, really is no different from all of the men. While Jocelyn and her lady's maid are rather removed from Will and his gang of weirdos, Kate is right in the thick of it. She gets hired on and travels with Will from tournament to tournament. She gets drunk in the pub with the boys, holds her own in a fight, and frequently teases them into incomprehension. She's just one of the lads, except she's not. She's so much more than that. Kate's first introduced as a ferrier, a blacksmith who mostly just makes horseshoes, and we're told that her husband was the blacksmith, but since he died she kept up the forge because she needs the money. That explanation, though, is pretty insufficient, and it's not soon after we meet her that we start to see why. I mean, yes, Kate is the kind of woman who can be goaded into repairing armor on credit because the other men "don't think you can do it." But she's also the type of woman who can whip up a suit of armor just as strong and good as the other knight's but nearly a third of the weight in a single night. I mean, we've been talking about ladies of STEM these past few weeks, and this is just another example of how interesting your story can be when you acknowledge the contributions that women make to science and engineering. Kate has found a new way to process steel so that it's much lighter but just as strong. She did. Her husband didn't teach it to her and she didn't steal it from some other blacksmith. She came up with it on her own. And the movie shows us that Kate's right. It is the best armor. It's amazing. The stuff can stand up to just about anything. But more than that, they show that it's wonderful but also that Kate faces many challenges in getting the world to recognize her genius. And I really appreciate that. Kate can make the best armor in the world, but what does that matter if no one will wear it? The only reason she can get Will to wear her stuff is because she essentially blackmails him, then she dares him to do it. She faces constant discrimination and sexism, and while she bears up under it, the movie doesn't shy away from telling us how hard it is. Kate has a hard life, but it's a life she's chosen, and she seems to be okay with that. Even better, she's not just one dimensional in her amazing blacksmith abilities. Yes, she is essentially a savant, but she isn't just left with that as her defining characteristic. Kate's also a bit of a romantic. While we never do meet her late husband, even in flashback, it's clear she married for love and that she loves him still. When she talks about him she looks soft in the eyes, and we feel the weight of his passing. Later in the film, when Will has decided to lose all of his jousting matches to prove his love for Jocelyn, the men think he's crazy, but Kate thinks it's a romantic. Turning to her, Roland asks, "Are you a woman or a blacksmith?" And Kate replies, "Sometimes I'm both." For me, in a big way, that sums up her character and why I like her so much. Because as a kid growing up, that's how I felt. Like the world demanded that I be either a girl or really interested in explosions. That I could be feminine or strong, but not both. But I am both. Femme is not fragile, and I don't have to like wearing pants in order to fight for feminism. They're not mutually exclusive ideas. The importance here, for me, is that none of Kate's character was accidental. It's not like they just happened to decide that the crucial blacksmith character in the movie be a woman on a whim. It would have been so much easier to make her a man. Or, at the very least, to make her a woman with a major male love interest. Like, say, Wat, the only other conspicuously single character. But the movie doesn't do that. Kate gets to be Kate. In love with her dead husband. Blissfully romantic. And yet still capable of wielding wicked hammers that can break bones and shape iron. She doesn't need a man to define her, but she's not the sort to declare her independence in spite of circumstance either. She's not one of those one dimensional "sexism is over" cardboard cutouts, she feels like a real live woman. She faces sexism and discrimination and hardship and loss, but she also goes out for a drink with the boys and invents brilliant new things and can burp longer than any of them. I'm not sure why being both is so threatening, but I have gathered from life experience that it is. That there's something really dangerous when women band together and say, "Yes, I am like other girls. What's wrong with other girls? What makes you say that because I like climbing trees and building go-karts and fighting with toy swords I'm not like other girls? What makes you say that other girls are bad?" That's a declaration of war, it seems, even if I'm not sure I can tell what it's a war against. But it is, isn't it? There's a war on, and it seems to want us to declare that we're "not like other girls", as if being like other girls is something to be ashamed of. I am happy to announce that I am like other girls. I like superhero movies, like a lot of girls, and comics, like many girls, and pretty dresses, like some girls, and blowing things up, like more girls than probably admit it. I am just like other girls because the differences aren't enough to make me lose my gender. They just make it all more interesting. 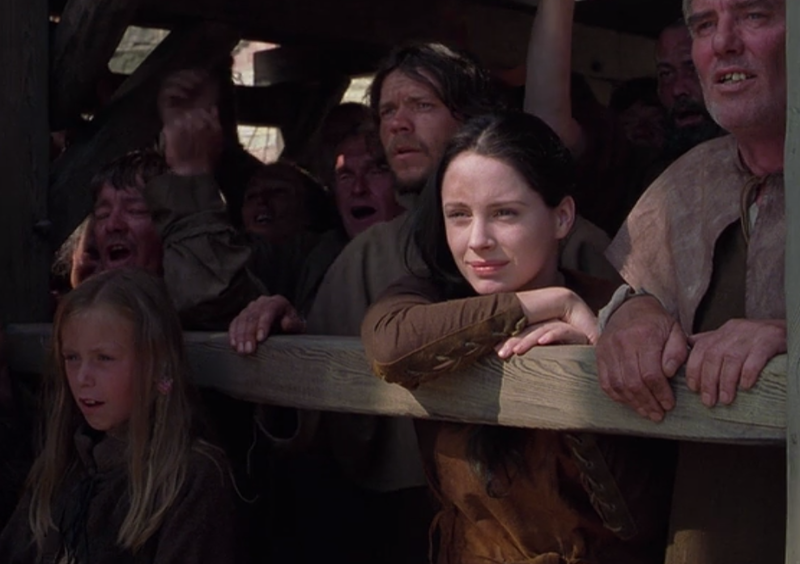 Kate can be a blacksmith and can be the single most competent person in the entire movie - which she absolutely is, watch it again if you don't believe me - and she can also be the one who walks into a room where a bunch of men are desperately trying to learn to dance and have them whipped into shape in an afternoon. Just because she's a brilliant engineer doesn't mean she can't love to dance. Just because she thinks it's romantic doesn't mean she makes bad armor. I love Jocelyn because she stands up for her interest in girly things and refuses to let them be devalued. But I love Kate because she can understand the importance of liking "girly" things and "manly" things and how liking both doesn't make her less a blacksmith or less a woman. It makes her more of both. Plus, there's something to be said for a movie where even though the two main female characters really have nothing in common or much interest in each other, they never get catty or mean towards one another. Kate only has nice things to say about Jocelyn, for all that she really doesn't get her. As a closing thought, I do have to say that this movie in general has absolutely wonderful things to say about gender and class. Roland and his love of embroidery and fine cooking is a great counterpoint to Kate, and Wat's raw emotionalism is such an interesting statement about masculinity - especially when we realize how easily and openly he cries. But all of that is stuff for another day. For now, let's think on this: who profits most from making it seem like a bad thing to be "like other girls"? And how can we teach everyone to say, "Sometimes I'm both." Because damn right you are, and so am I.
Kate's first introduced as a ferrier, a blacksmith who mostly just makes horseshoes, and we're told that her husband was the blacksmith, but since he died she kept up the forge because she needs the money. The blacksmith's guild allowed widows of blacksmiths to do this, incidentally, if they'd learned the trade during their marriage (and by "allowed" I mean used its clout to make sure they could, no matter what local laws might otherwise interfere with a woman running a business) - though, they weren't allowed to make weapons and armour. Which all makes Kate's backstory a particularly interesting exploration of the sexism of the time. (It also means Kate isn't as anachronistic as some think). (And it's refreshing to see a fan of Kate who doesn't disparage Jocelyn for her sake). Huh, interesting. It's kind of cool to see how the writers of this movie actually got more right than they got wrong, but the frosting of anachronism made it easier for audiences to accept. What a great, thoughtful article. You are right, Kate is possibly the strongest character in the film, at least on a par with William. Yes, she can be 'both' and she's all the stronger for it. For me she makes the film, I've always thought her the best character in it. Best wishes. Kate is by far the strongest character in the film. Good article.